Do you listen to music or silence when writing? The other day when I was at work (and lip syncing at my desk to a Lauryn Hill song) I got curious about how many other writers listen to music while writing. I find that whether I listen to music or silence depends on my mood. Sometimes listening to music helps me stir the creative juices up while other times it can be distracting. When I’m in the mood for listening to some tunes, I like to use Pandora because it introduces me to new songs, genres and artists. Below are some of my go-to stations that I like when writing, and please feel free to suggest some stations in the comments sections! Wax Tailor – I discovered this French trip hop/hip hop producer when I was listening to another station. I like how he samples movies and mixes it with chill hip hop beats. I usually listen to this channel as I research or write. Florence and the Machine – Great indie rock band! I love Florence Welch’s voice and her lyrics inspire me to want to be a better writer. This station is also good for helping me to wake up in the morning. Gnarls Barkley – The station has a nice balance between electronic hip hop and old school R&B style that’s pretty easy to listen while writing. The station also has an interesting mix of oldies music from the 60s/70s to more recent electronic rock bands. The Fugees – The music on this station varies from spoken word rap to 80s/90s hip hop to chill reggae songs. 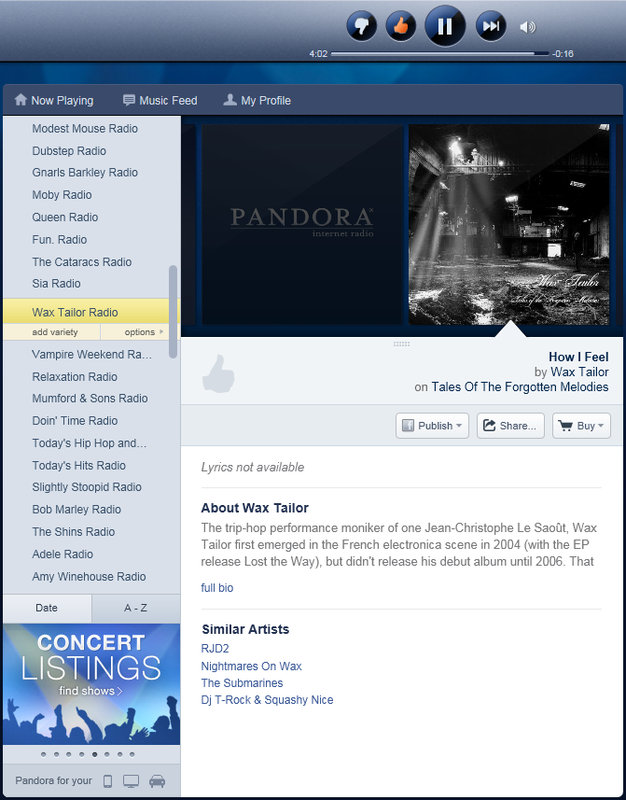 I’m usually bobbing my head when I’m listening to this channel and getting into my flow of writing. Mumford & Sons – This band from England mixes folk, bluegrass, rock and country for music that is unique and beautiful. Like Florence and the Machine, their lyrics can be very poetic and touching. I like to listen to this channel when I’m starting on a new draft because I find it helps me concentrate on my writing. Amy Winehouse – Her soulful voice and funky R&B sound makes for really good music when you’re trying to get pass a writer’s block (which happens to me – a lot). Overall, the station is kind of jazzy with occasionally some oldies and mellow hip hop tunes. A screengrab of my Pandora stations. What do you like to listen to when you write? I’m always up for trying new stations and finding ones that help me write better.